Like any hot dog on a sizzling grill, the classic Wienermobile has plumped up a bit through the ages. 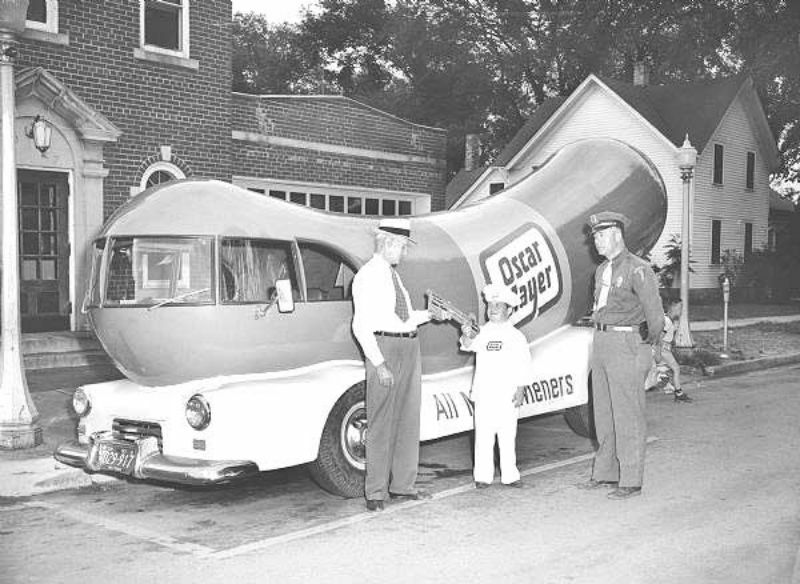 But its hot dog evangelizing mission has remained the same since 1936. 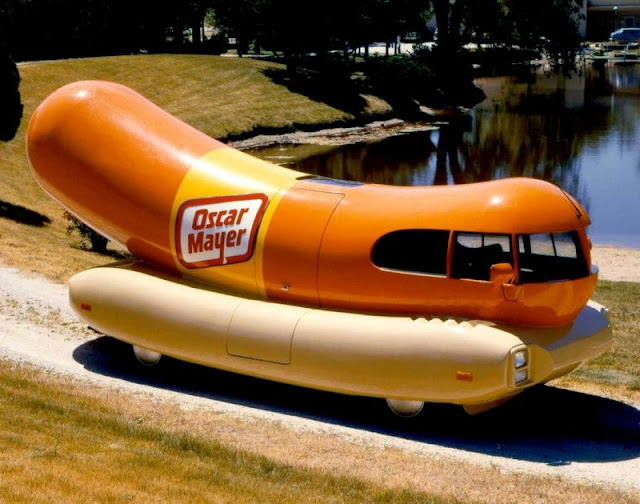 And nothing has changed with its iconic orange and yellow shell, either. The Wienermobile continues to roll on as a piece of classic Americana. 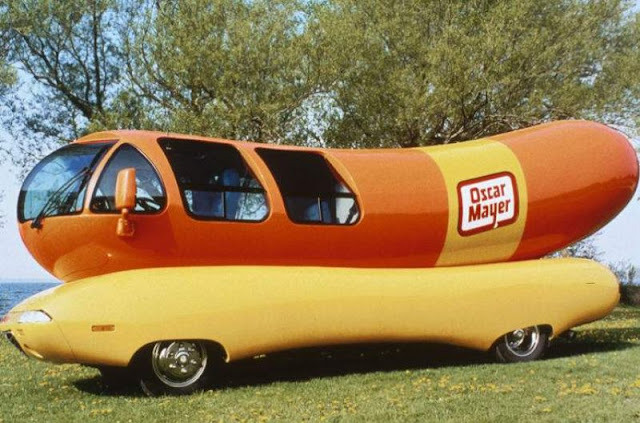 Drivers of the Wienermobiles are known as Hotdoggers and often hand out toy whistles shaped as replicas of the Wienermobile, known as Wienerwhistles. 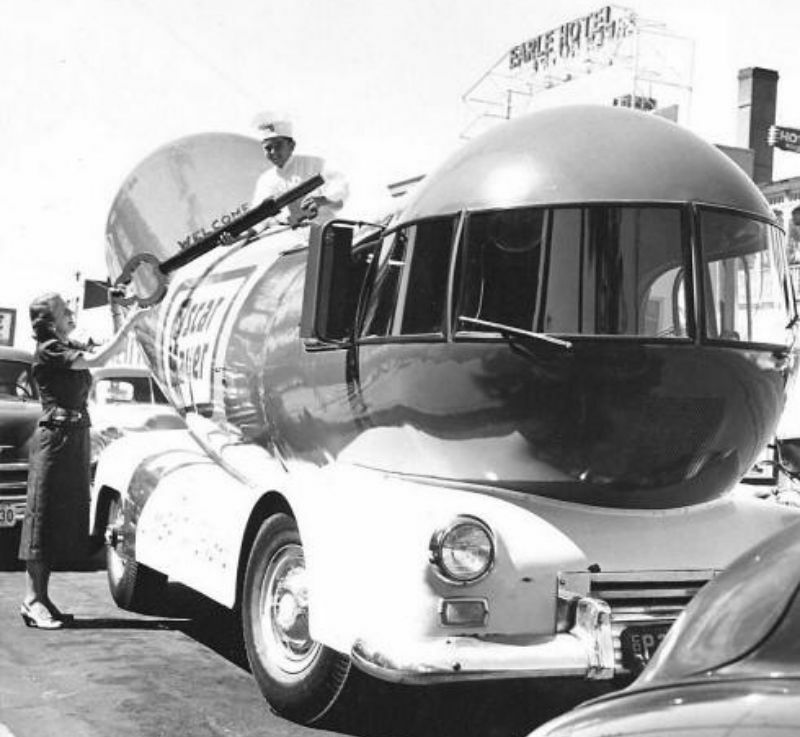 The first version of the Wienermobile was created in 1936 by Oscar Mayer’s nephew, Carl G. Mayer. 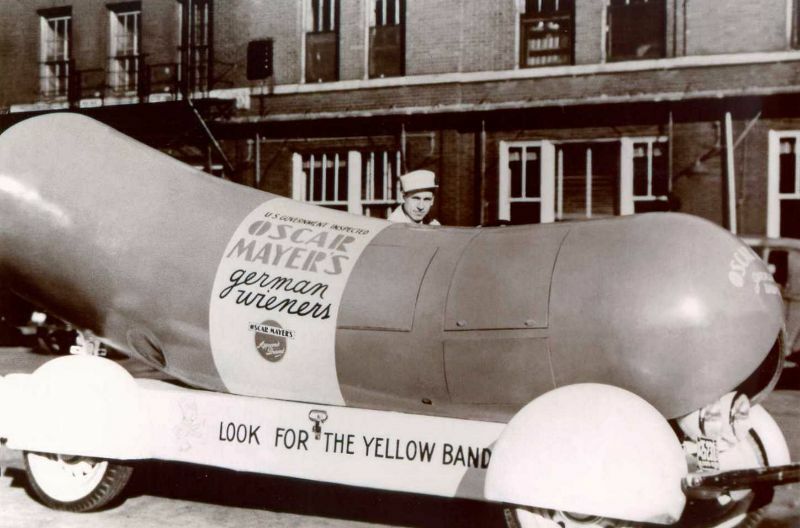 The original model cost just $5,000, and was a small, metal wiener-shaped shell that stretched 13 feet long, often seen cruising through Chicago’s streets to promote Oscar Mayer’s wieners. 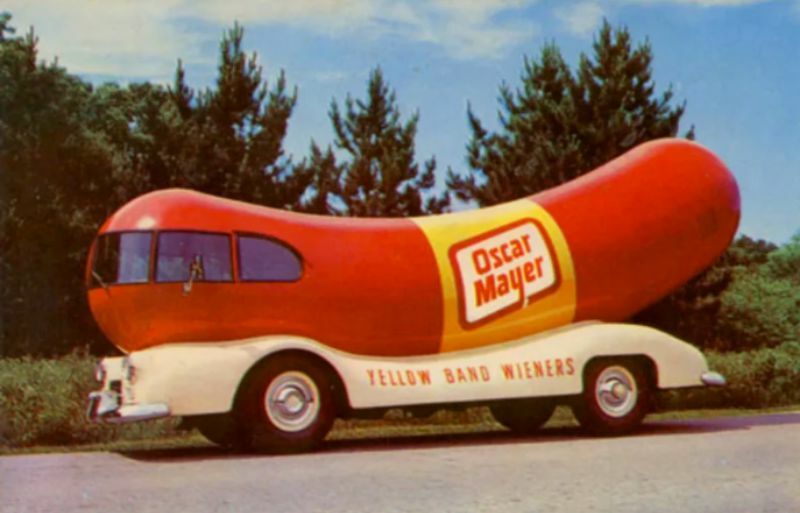 Although fuel rationing kept the Wienermobile off the road during World War II, in the 1950s Oscar Mayer and the Gerstenslager Company created several new vehicles using a Dodge chassis or a Willys Jeep chassis. 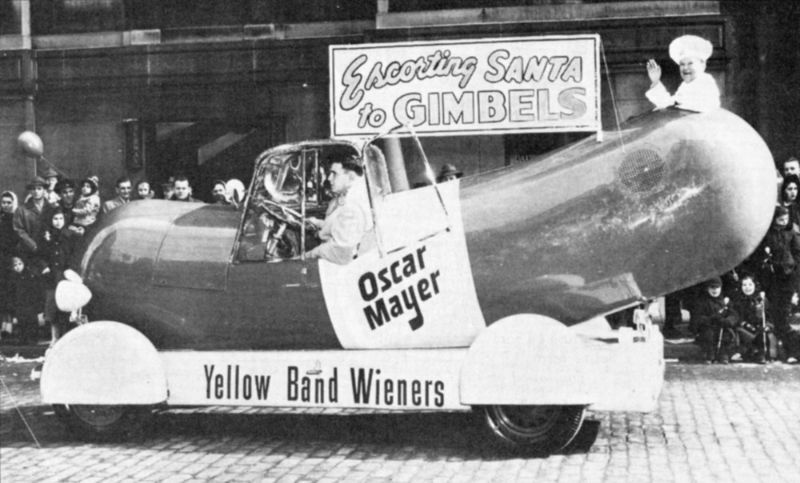 These Wienermobiles were piloted by “Little Oscar” (portrayed by George Molchan) who would visit stores, schools, orphanages, and children’s hospitals and participate in parades and festivals. 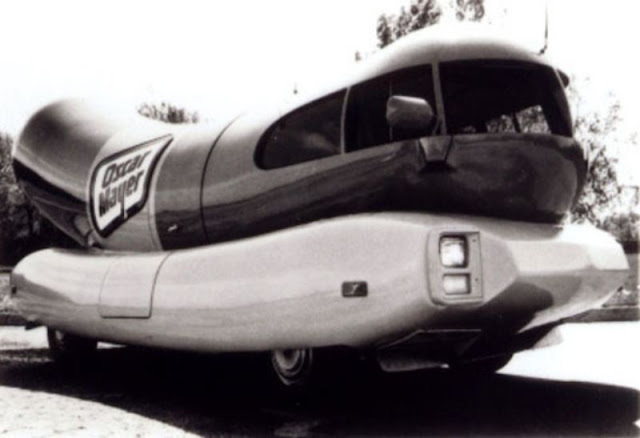 In 1969, new Wienermobiles were built on a Chevrolet motor home chassis and featured Ford Thunderbird taillights. The 1969 vehicle was the first Wienermobile to travel outside the United States. In 1976 Plastic Products, Inc., built a fiberglass and styrofoam model, again on a Chevrolet motor home chassis. 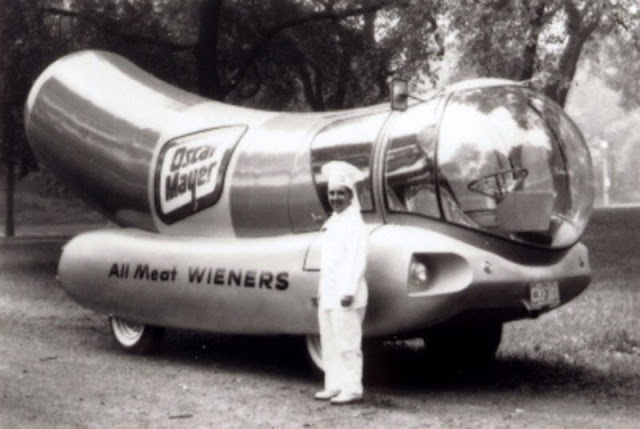 In 1988, Oscar Mayer launched its Hotdogger program, where recent college graduates were hired to drive the Wienermobile through various parts of the nation and abroad. 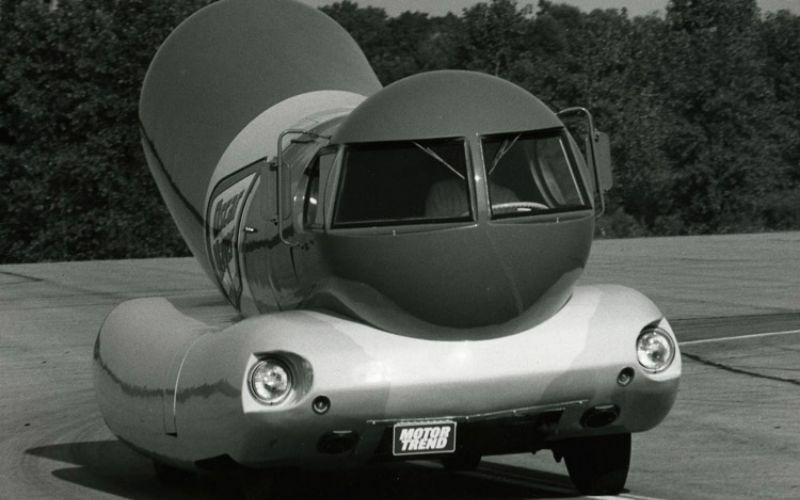 Using a converted Chevrolet van chassis, Stevens Automotive Corporation and noted industrial designer Brooks Stevens built a fleet of six Wienermobiles for the new team of Hotdoggers. With the 1995 version, the Wienermobile grew in size to 27 feet long and 11 feet high. 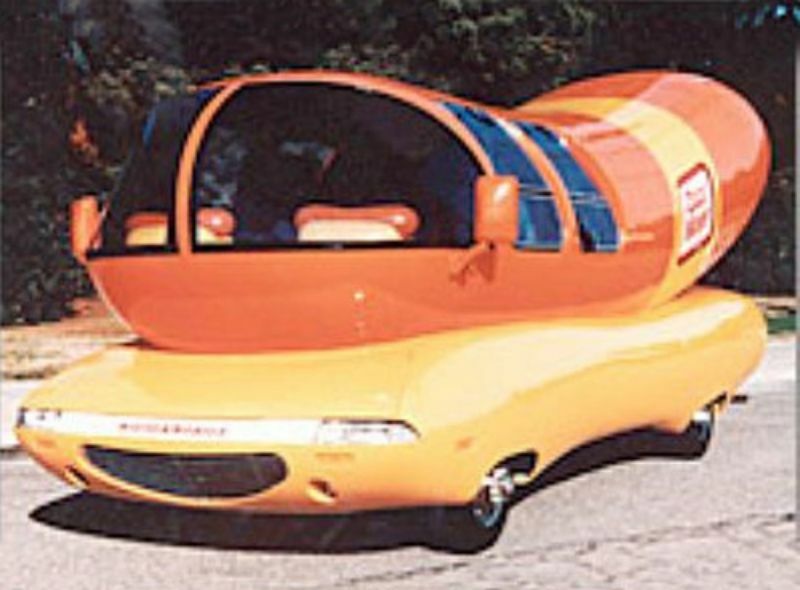 The 2004 version of the Wienermobile includes a voice-activated GPS navigation device, an audio center with a wireless microphone, a horn that plays the Wiener Jingle in 21 different genres from Cajun to Rap to Bossa Nova, according to American Eats, and sports fourth generation Pontiac Firebird taillights. 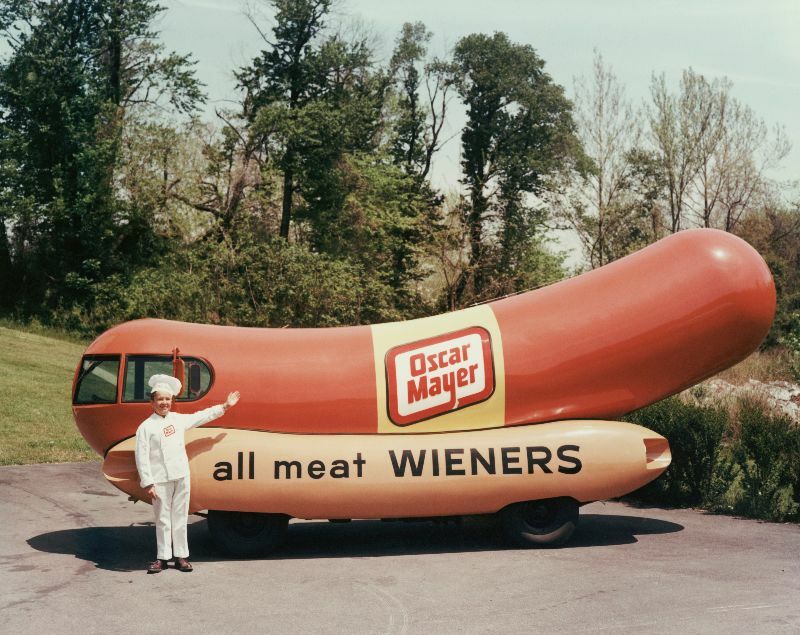 Following mechanical problems with the Isuzu Elf, Oscar Mayer decided to adopt a larger chassis in order to accommodate an increase in size of the signature wiener running through the middle. 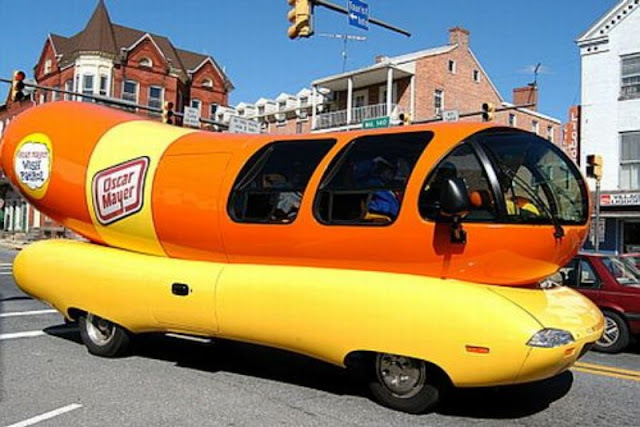 While the Wienermobile was not as long as the 1995 version, it was considerably wider and taller. Craftsmen Industries went through numerous overhauls of the truck including a flipped axle and a leveling kit. 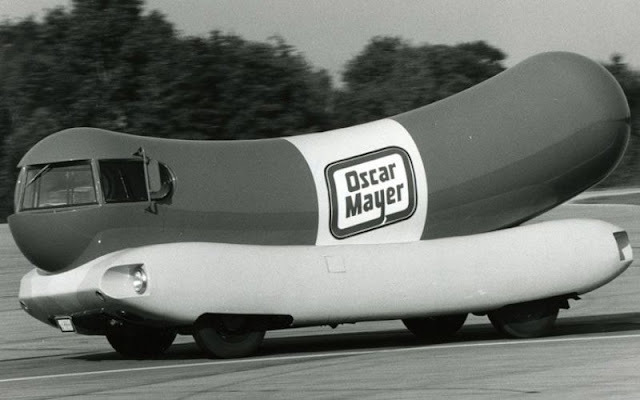 This version held a record for numerous suspension problems, most leading to the chassis not being able to hold the large weight of the Oscar Mayer Wiener. 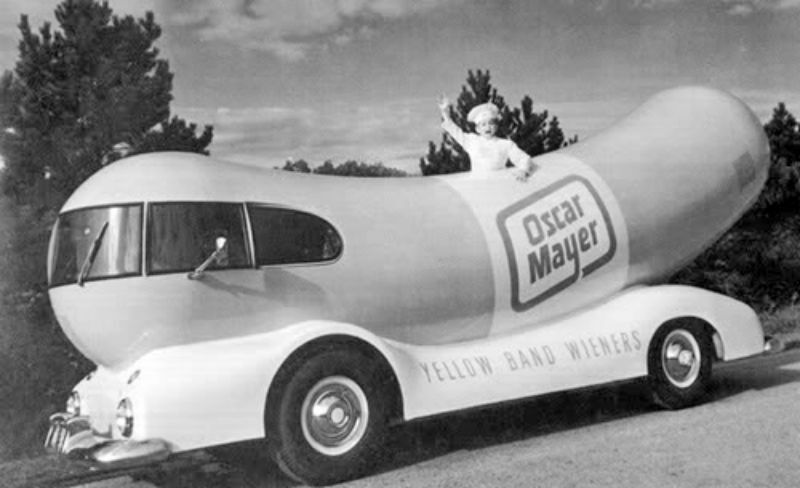 In 2004, Oscar Mayer announced a contest whereby customers could win the right to use the Wienermobile for a day. 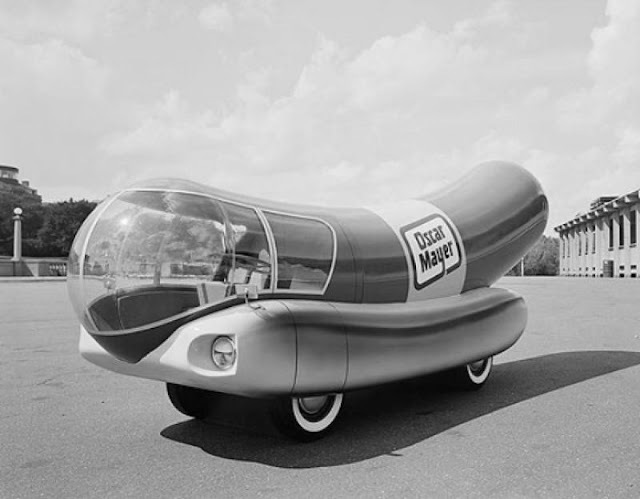 Within a month, the contest had generated over 15,000 entries.